Perennial, aromatic, evergreen shrub; stems solitary or branched from the base with shredding, grey or light brown bark when older, or with a dense, grooved, white-woolly hairiness when young, 0.1-2.0 m tall. Principal leaves unstalked or short-stalked, silvery-hairy, typically wedge-shaped with 3 blunt teeth at the tips or sometimes 4-9 toothed or shallowly lobed, 1-4 (rarely 6) cm long, 2-13 mm wide. Heads discoid, numerous in a narrow to broad inflorescence; involucres narrowly bell-shaped, 3.0-3.8 mm tall; involucral bracts elliptic to obtuse, greyish-hairy; receptacles glabrous; female flowers absent; disk flowers 3-6, sometimes up to 12 at higher elevations. Dry to mesic meadows and slopes in the steppe to subalpine zones; common in SC BC, rare in SE BC; E to AB and S to ND, NM, AZ, and CA. 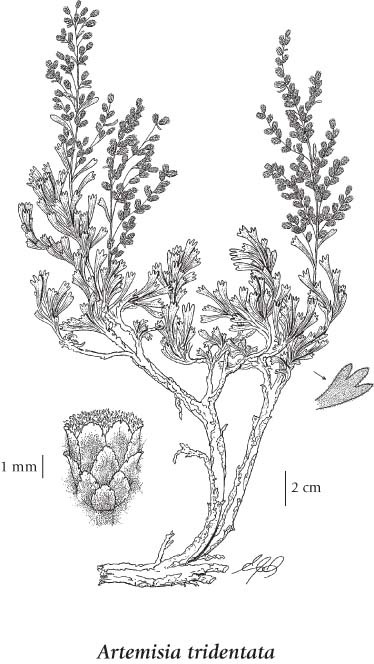 Artemisia tridentata subsp. trifida (Nutt.) H.M. Hall & Clem. Artemisia tridentata var. parishii (A. Gray) Jeps.